‘Tis the season for Christmas concert! 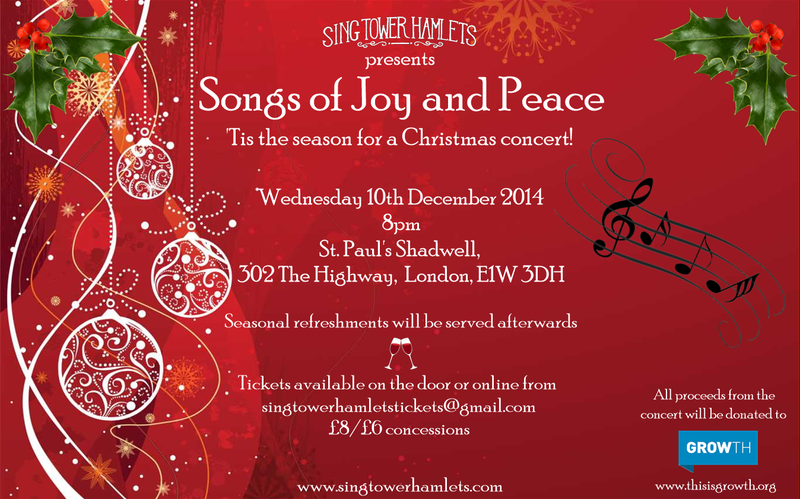 On Wednesday 10th December we are performing our concert Songs of Joy and Peace* at St Paul’s Shadwell as a fundraiser for the wonderful GrowTH night shelter in Tower Hamlets. Tickets are £8 (or £6 concessions) and can be booked in advance by emailing singtowerhamletstickets@gmail.com. We have some excellent treats of Christmas songs to share with you! Then on Sunday 21st December we will be leading the carols at the St Paul’s own carol service – all welcome! * Bonus points if anyone can place the lyric reference!